No, we didn’t get that title wrong. Going M.A.D. and disintegrating isn’t always bad and worrisome. When it’s in the context of brilliant art, it can be sheer genius. Which is why the Middle East’s first mechanical art gallery, MB&F M.A.D.Gallery, is exhibiting ‘Disintegrating II’ by Swiss artist Fabian Oefner. 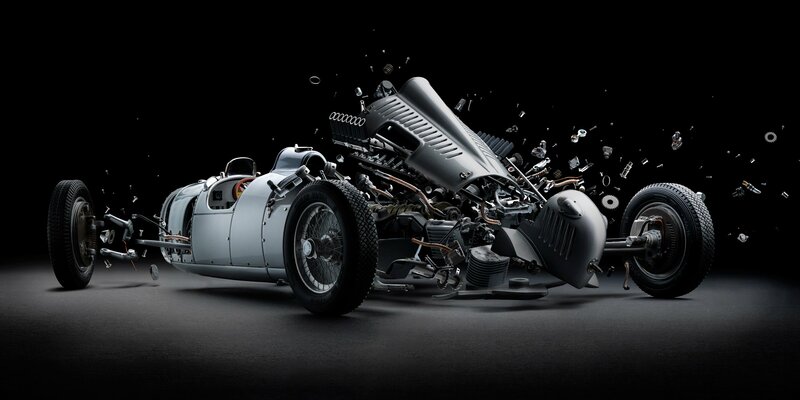 The second part of Oefner’s ‘Disintegrating’ series which debuted in Geneva in 2013, the five new artworks represent exploded views of iconic cars: the Porsche 956, Audi Auto Union Type C, Ford GT40, Bugatti 57 SC and Maserati 250F (vintage red car in our cover image). 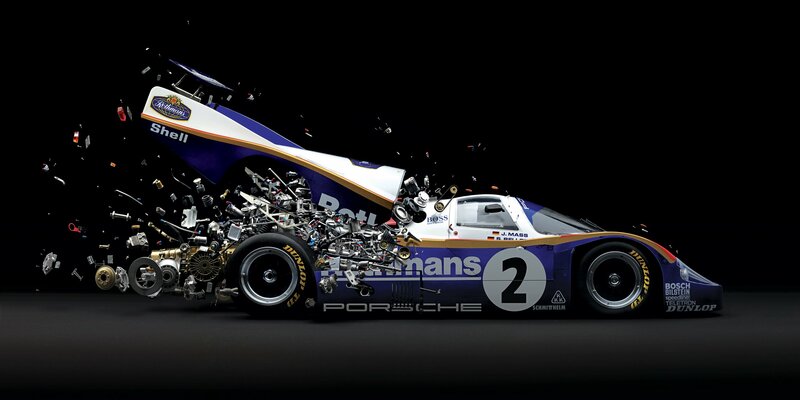 The artist meticulously created the illusion of an exploding automobile by deconstructing scale-models, photographing each component piece by piece, in a very specific position, and setting the images up to form a deconstructed “bigger picture”. Fabian’s strength as an artist comes from fusing art and science to create images that are appealing to both the heart and the mind. He captures life moments that are invisible to the human eye and that could otherwise go unnoticed: phenomena like sound waves, centripetal forces, iridescence, fire and even magnetic ferrofluids come to life in his works, and the complex construction of an automobile is no exception. The creative process and creation of his mind-boggling ‘Disintegrating II’ artworks took 2 months to materialize; over 2000 photos were taken to form a single “whole” image bringing perfect sense to chaos. The impressive photo series fools the observer into seeing the images as computer-generated renderings rather than the real photographs that they are. “I have always been fascinated by the clean, crisp looks of 3D renderings. So I tried to use that certain type of aesthetic and combine it with the strength of real photography,” explained Oefner. Well, he sure did succeed in doing exactly that! Each image is available in 2 sizes: 140x70cm limited to 8 prints, and 230x115cm limited to 3 prints. Next Post TAG Team With OneRepublic! © 2018 Mr. Ping Life, Inc. All Rights Reserved.